With Kidney Health Week taking place from 8-14 April, now is a great time to start thinking about the impact of kidney disease in your practice and how this affects the day-to-day interactions you are having with patients. In Australia, kidney disease really tends to fly under the radar – despite 1.7 million people having signs of kidney disease, most of them don’t know it and up to 90 per cent won’t experience any symptoms until it is too late. I have worked for Kidney Health Australia for nearly 10 years now and in that time, I have seen the difference that proactive care can make – it can be the difference between travelling for hours, multiple times a week to attend dialysis sessions or peace of mind knowing that a loved one is less likely to experience a cardiovascular event like a heart attack or stroke. During Kidney Health Week, we are spreading the message ‘Don’t Be Blind to Kidney Disease’. The campaign asks people to know if they are the ‘1 in 3’ at risk of chronic kidney disease (CKD) and if they are to do something about it. People identified as being at high risk of CKD are encouraged to visit their GP and undergo a kidney health check (blood test for eGFR, urine albumin /creatinine ration and a blood pressure check). That’s why we’re keen to keep doctors updated on our work. CKD is defined as the occurrence of kidney damage and/or reduced kidney function that lasts for three months or more. CKD usually develops over a number of years and, if detected early and managed appropriately, the otherwise inevitable deterioration in kidney function can be reduced by as much as 50 per cent. That’s quite a difference! And one that can have a huge impact on a patient’s outlook and quality of life. GPs and their practice team play a key role in identifying people who are at risk of CKD and ensuring that they have the tests needed to identify or exclude a CKD diagnosis. There are nine risk factors for CKD: diabetes; high blood pressure; heart problems or stroke; family history; history of acute kidney injury; smokimg; Aboriginal or Torres Strait Islander; obesity; and being aged 60 years or older. Individuals identified as being at increased risk of CKD should undergo an annual kidney health check every one to two years. There are three components to a kidney health check and these are easy to build into your existing practice. Primary care practices are the usual setting for initial assessment and diagnosis of CKD and are well-placed to conduct kidney health checks led by either the GP or the primary healthcare nurse. The goals of best practice CKD management are to firstly prevent the condition developing, secondly to detect CKD in its earliest stages, and thirdly to implement optimal management strategies that delay progression and the development of other comorbid conditions. Key prevention activities include managing cardiovascular risk, blood pressure and diabetes appropriately and also encouraging lifestyle modification and providing people with resources and education to assist them with their self-management goals. For people diagnosed with CKD, halting further progression is vital. CKD is a major independent risk factor for cardiovascular disease, and for people with CKD, the risk of dying from cardiovascular events is up to 20 times greater than the risk of requiring dialysis or transplantation.Interestingly, the increased cardiovascular risk is noted from the time a patient first develops albuminuria, again highlighting the importance of early detection. First line management strategies for CKD include recommending lifestyle changes (SNAP – smoking, nutrition, alcohol, physical activity) and prescribing ACE Inhibitors or ARBs to lower blood pressure and slow the progression of albuminuria.CKD management information including CKD staging, colour-coded action plans and referral guidelines can be found in the publication CKD Management in General Practice. Kidney Health Australia has a large range of resources, education and support available to assist in the management of kidney disease in your practice. We run a comprehensive Primary Care Education Program which provides access to free online and face-to-face learning, quality improvement programs and the well-regarded guideline handbook CKD Management in General Practiceand app CKD Go! 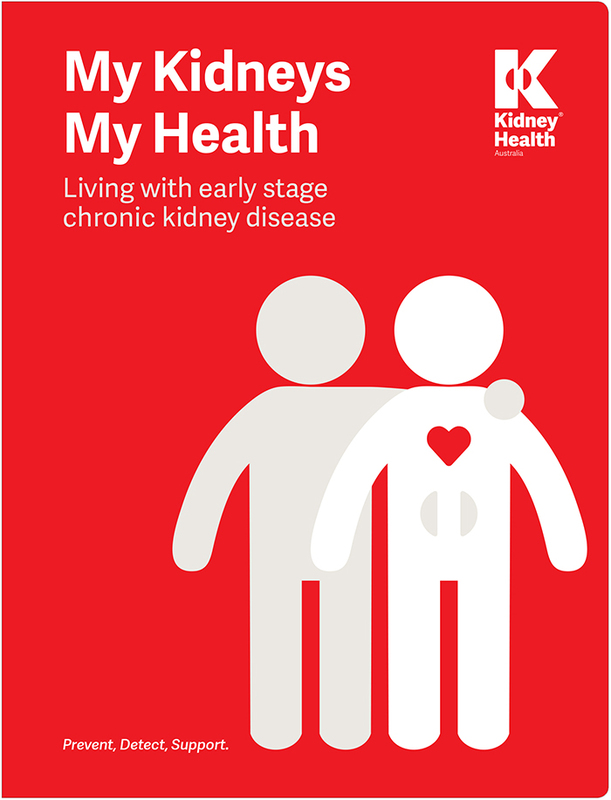 In addition, we have a huge range of fact sheets and books available to support people living with kidney disease and these are translated across 19 different languages. Two key resources that GPs can provide their patients are My Kidneys, My Health (a free handbook and app designed to help people navigate a CKD diagnosis and assist them with self-management and support) and a referral to the Kidney Helpline (a free national phone-support service offering information, support, referral and advice to patients, their families and health professionals – 1800 454 363). Many GPs find these resources beneficial as part of the care planning process. Kidney Health Week is our major awareness campaign. This is a fantastic time to focus on CKD in your practice, run some activities with your team and help us spread the prevention message. Look out for our social media content and visit our website to access free resources and materials. Alternatively, keep in touch with Kidney Health Australia by subscribing to our quarterly newsletter – Your Kidney Connection www.kidney.org.au/about-us/subscribe, drop us a line at info@kidney.org.au or call us on 1800 454 363. Influenza (flu) vaccinations are now available from most GP clinics and it is a timely reminder to all Victorians to book an appointment to be immunised against the flu.